Jotham Meeker, misionary and printer, arrived in Kansas in 1833 and set up a printing press at Shawnee Baptist Mission. Meeker joined the Ottawa Indians in 1837 and founded a mission on the Marais des Cygnes River where present day Ottawa stands. The Ottawa Indians began moving to Kansas from Ohio in the early 1830s. 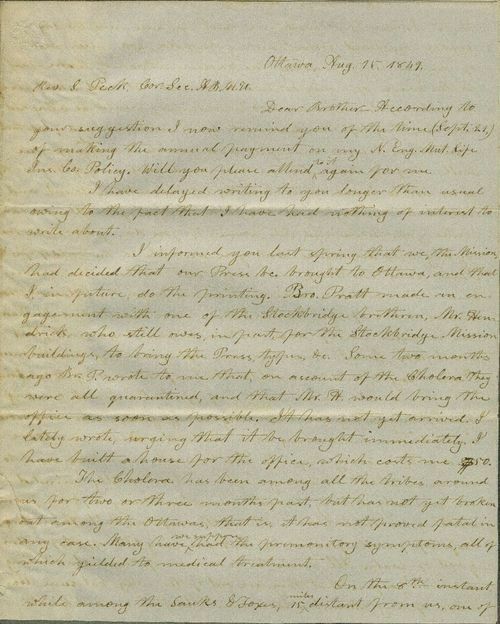 Meeker opened his letter with personal matters and them turned to affairs concerning the Indians in Kansas. He talked about cholera, which killed many Indians in the summer of 1849.